so creamy and frothy so good~ all I had to do is add hot water!! 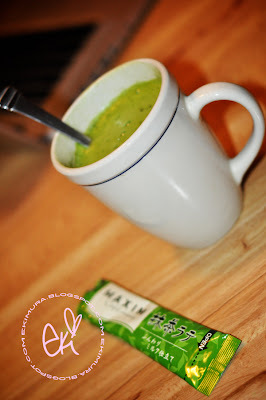 Ahhhh what a coincidence I'm drinking a cup of Matcha green tea as I'm reading your post LOL! I'm a green tea freak! anything green tea flavoured I want! I've never had a green tea latte and that looks surprisingly yummy! Lolz! You and my mum both! She's a retired cha-no-yu teacher! That does look good and frothy!! Good thing you said latte, cuz I was gonna ask why your tea was all foamy!! LOL! I love the little single serving packets of Green Tea! Perfect for work!! Oo! so healthy! hehe! but isn't it too hot to drink in summer x.X Or do you drink cold tea? but it tastes kinda different eh~~ hehe. I always reach for my cool glass of water instead of hot green tea in the afternoon~~~ hehe. Your green tea looks really green! I prefer the tea bag version more than the powder version though. Probably because I had the powder version in a restaurant before and the water wasn't hot enough, so I was drinking some powder which was weird. Green tea is such a healthy drink, you remind me to get some soon instead of depending mainly on sugary drinks. Thank You for stopping by and following sweetie, we certainly do have great TASTE LOL! You totally made me wanna try it! 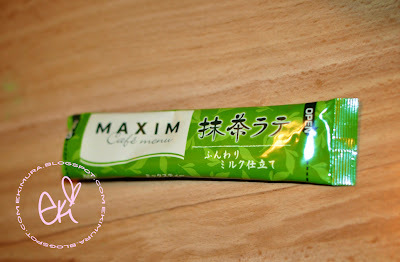 i have never tried a powdered green tea before..
i want to try that too! hi~ new to your blog, just wanna drop a line and say hi! that green tea powder is so good! mmMMmmmm..! hey sweets! man the tea looks so yum! mmMmmMm I loved tea latte's! The powder mix is really hard to find, but it never stops me from hunting! Val has told me so much about you! She showed me your account when i visited her and I wanted to say you are an amazing artist and your makeup tutorials are awesome ^O^! Hmm I will have to try this I am intrigued haha. Thanks for the post! What sort of tea(s) would you recommend (that I can get in US or maybe Japanese Grocery? That all I have here haha) Thanks! 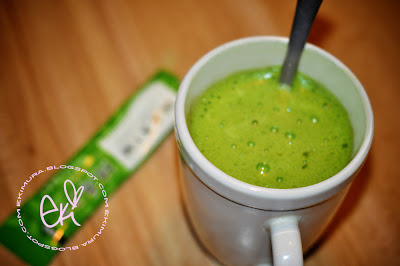 I like to drink green tea after dinner sometimes, when I feel bloated :) That matcha latte looks so good.. never tried it! I only have tea leaves haha. Wow~! And all you had to do was add water? It looks like it's right out of a coffee shop or something! It looks so pure! SO green!